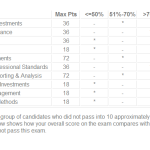 In just under two weeks I will be retaking the Level II CFA exam. Last year, I studied about 150 hours and did not pass; I was in band 6/10. This year, I have put in a lot of additional hours studying, doing practice problems, memorizing formulas, and taking practice exams. I took the USC/CFALA review course, which was 6 hours of in-person instruction every Saturday for about 12 weeks. The class was structured so that they would bring in a different instructor for each topic (Economics, Fixed Income, Derivatives, etc.) While there were some good instructors, I felt that overall I could have learned more by studying on my own. Some instructors focused on broad overviews of the material rather than focusing on the mechanics of answering questions correctly. The format of class could have been improved by making it a straight test-prep class that focused more on practice questions and important formulas. 1. Reviewed the Schweser notes material for almost every chapter, and done the Schweser end-of-chapter problems. I felt that their material was very good. I also did some of their online Question Bank problems, but I thought those were not as good since some of them are not in item set format. 2. Reviewed the CFA Institute material for the most important topics (Equity, Financial Reporting) and done the end-of-chapter problems. I think it’s critical to do the actual CFA Institute problems for the heavily-weighted topics. So one way to think about my results is that I really just need to answer 8 more questions correct!